As you prepare for grilling out with your family this holiday weekend, we have a few tips for you to help you create perfect burgers AND an awesome recipe for some outta this world sliders! When making burgers, to keep hamburgers moist, first combine the filling ingredients, then add the meat and mix just until combined. Overmixing can cause the burgers to be dense and heavy. If you don’t like getting your hands messy when mixing the meat mixture, put the ingredients in a large resealable plastic bag, then mix by squishing. Or if you do use your hands, first dampen them with water and nothing will stick. Remember, the leaner the ground beef, the drier the cooked burger will be. Ground sirloin makes the leanest burgers, then ground round, ground chuck and, lastly, ground beef. Keep in mind that the more fat there is in the meat, the more shrinkage there is during cooking. So if you’re making burgers out of regular ground beef, shape the patties to be slightly larger than the bun or press an indent in the center with your thumb to prevent shrinking. Don’t use a metal spatula to smoosh, or flatten the burgers while cooking…you’ll squeeze out all of the succulent juices! Thank you to seriouseats.com and tasteofhome.com for the recipe and grill tips! Now here’s the ultimate slider recipe from J. Kenji López-Alt. Enjoy, and Happy Labor Day! Heat vegetable oil in 10-inch cast iron or nonstick skillet over medium-high heat until shimmering. Add half of onions and pinch of salt and cook, stirring frequently, until light golden brown, about 3 minutes. Add 2 tablespoons water and continue to cook, stirring frequently, until onions are deep brown and thin layer of browned onion juice coats bottom of pan, about 4 minutes longer. Remove pan from heat and transfer onions small bowl. Add raw onions to cooked onions and toss thoroughly to combine. Place bottom buns upside down on top of patties and top with top buns. Place clean folded kitchen towel on top of burgers so that all burgers are covered and towel drapes over edges of pan (be careful to keep pan away from direct flame). Continue to cook until burgers are cooked through and buns are fully softened with steam, about 2 minutes. Remove towel. Remove top and bottom buns from burgers. 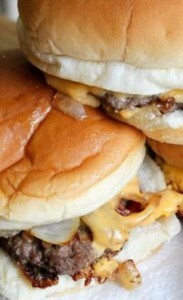 Place 1/2 slice cheese on top of each patty and return top bun to burgers. Cover with kitchen towel and continue to cook until cheese is fully melted, about 1 minute longer. Meanwhile, place 2 pickle slices and condiments as desired on bottom bun. Lift towel. Transfer burgers, onions, cheese, and top buns to bottom buns. Serve and repeat steps 2 through 4 with remaining burgers.